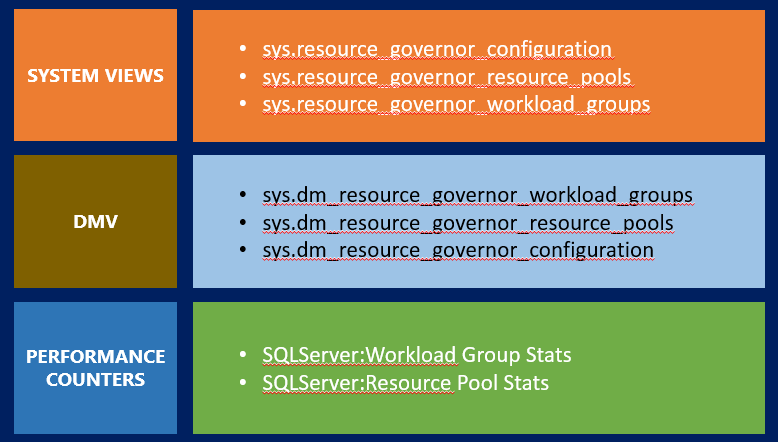 Archive by category "Performance Tuning"
Quick and useful tips on using Resource Governor in your SQL Server environment. I have selected randomly on some of the Resource Governor related T-SQL queries that might be useful in your work environment. How does the resource governor default settings look like? Below is a simple screenshots taken from SSMS and also from the resource governor properties. How does the resource governor would look like after configuring a successful resource governor? 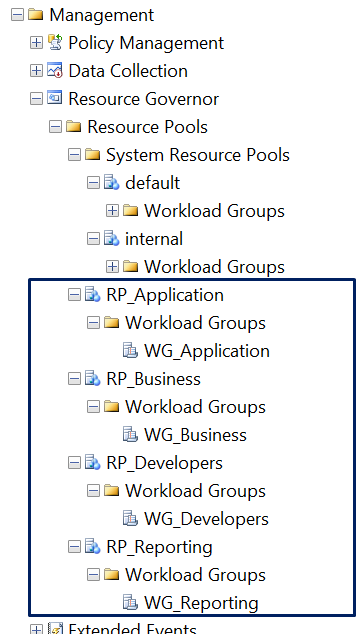 This can be seen from the below screenshot, which shows four resource pools and workload groups configuration, which has dedicated lanes for Applications, Reporting systems, Developers and Business users. Resource Governor helps sorry saves DBA’s life in terms of performance improvement by deriving proper lanes on what applications or which service accounts should have high horse power when it comes to CPU & I/O usage. This feature was introduced in SQL Server 2008 and made available in Enterprise, Developer and Evaluation editions only. This has got the ability to classify connections and route the workload to specific already derived lanes by DBA as per the business requirements. This is limited to SQL Server Engine only and self contained and instant specific only. This has got 3 main below concepts. Below picture explains the available system views, DMVs, Performance counters that are specific to Resource Governor only. Below is the cheat chart, which will give you a quick glimpse on most of the possible issues, that you face in your day to day SQL Server life. This chart also provides you with available SQL Server Admin tools from left to right in the top, to tackle the issues that are relevant to your problems. This also explains a good understanding on available SQL Server admin tools that can be used to tackle problems that you may be facing in your work environment. At least now you know where to start if you hit with any performance or other issues. 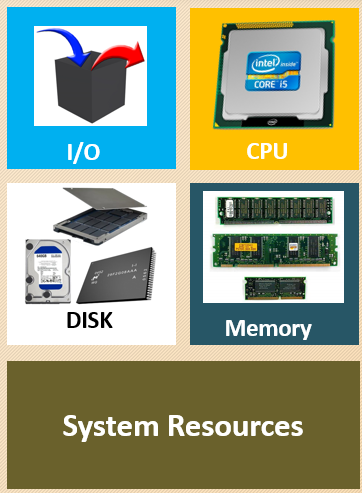 Below are the main system resources and are the key elements for better performing server. CPU: We definitely require more than one CPU to perform multiprocessing and helps any program to be healthy enough with all I/O operations. RAM: Even if you are not a DBA, you should be aware of the memory that is allocated for your SQL Server instances. Memory Sizing can be done based on the number of transactions that is going to hit the server. Any environment having high transaction should have highly allocated memory to process multiple operations in parallel. Disk: Disk is the storage area where every single transaction stores and retrieves data from as part of the request from applications, users. Having good amount of understanding and knowledge on database & log files and their location, on these sort of storages is a must, even for non DBA’s. Monitoring and maintaining the data storage, RAID levels, etc., are some of the key activities for every single DBAs. I/O: Any Input and output to and from applications/users is calculated with the I/O level. As part of the user or application’s request the I/O part plays a major role and any performance issues will affect the time taken to retrieve the data. A simple screenshot below shows you how you can easily enable/disable resource governor. 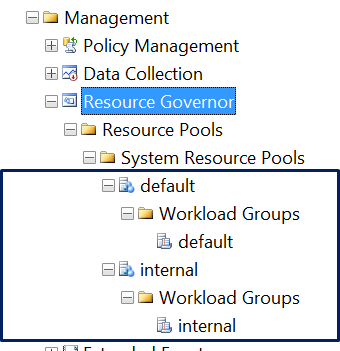 By using SQL Server Management studio, connect to the instance where you need to enable Resource Governor. Then navigate down to Management and expand to see resource governor. There you can simply right click and choose Enable from the pop up menu. You can also enable by using T-SQL by simply passing below command. To disable via GUI, using your SSMS navigate to the management again and then right click on Resource Governor and choose Disable from the pop-up box. Alternatively, you can pass below T-SQL command to disable. Every one running SQL Server has always had the same issue of memory. Whatever the extra memory is given to windows, it is all eaten by the SQL Server alone. No matter what the process is going on, the memory takes much resources for all related to SQL Server. How can we control the memory issue. Well there are some possibilities from SQL Server that we can restrict the server to occupy the server memory. By default the server won’t display the advance options to enable this service. So follow the steps below to view the memory usage. After this you can run the below query to see the usage. Then use this to change the server memory. Then again you can check the usage using the query which we have see earlier.